Although construction was authorized in August of 1941, the project was shelved until the end of WWII. In 1946, after a delay of five years, work began with fervor. The mightly Allatoona Dam was set in place on the Etowah River. Unfortunately, the town of Allatoona was flooded, along with many farms, homes and businesses, when the land behind the dam turned into Allatoona Lake. Lake Allatoona was a Christmas present that we continue to enjoy today. That’s when the lake began to fill in 1949. The power plant began to operate on January 31, 1950. By May of 1950, the lake was full, with 12,010 acres of water. The total cost of the Allatoona Dam project for construction, land and relocation was $31,500,000 in 1950. That’s roughly $320 million in 2017 dollars, due to inflation, or how much you would pay for a fancy used Boeing 777 jet. I wonder if a dam is cheaper to operate than a luxury jet? During the 1980s there was a prolonged drought in our region. During the peak of the drought in 1986, tree stumps, old roads, and foundations of houses were clearly visible above the water line. The history of Lake Allatoona has provided one especially huge benefit. 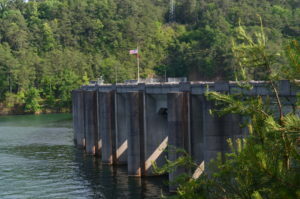 Authorities say Allatoona Dam has prevented nearly $80 million in flood damages since 1950. In 1998, Lake Allatoona counted more visitor hours than any of the other 450 Corps of Engineers projects in the United States. To most of Lake Allatoona’s six million annual visitors, recreation is their highest priority. The lake offers everything you could hope for along its 270 miles of shoreline. Come and find the most beautiful spots for rest and relaxation, hiking and exciting water sports, and burning burgers in the great outdoors.